Pennywise the Dancing clown is known for lurking in sewers, fire-scorched houses and apparently…file cabinets? 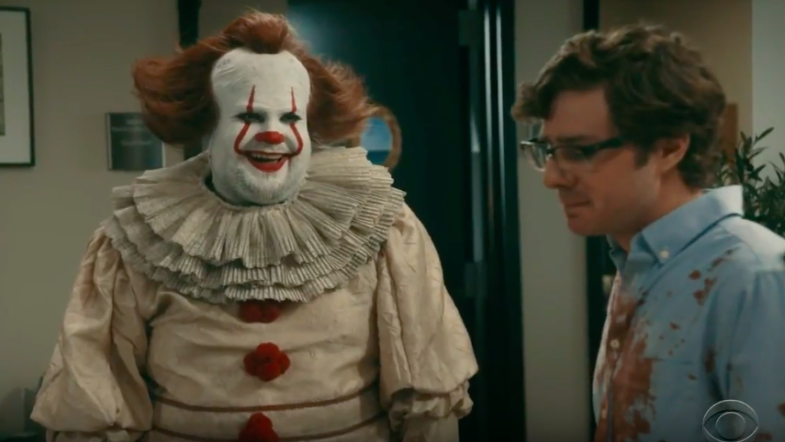 Hilarious comedian James Corden managed to bring new depths to Stephen King’s killer clown Pennywise during a segment on The Late Late Show last night (September 13th). Donning the clown’s iconic getup, Corden threw in a little twist when he posed as the IT worker we all hope to avoid. Joined by a surprising yet equally terrifying guest, Corden gave us the giggles we all needed after It’s terrifying premiere last week.